Two of the Premier League's promoted teams suffered heavy defeats on Saturday but Brighton can continue to enjoy life in the top flight with a victory over Stoke. 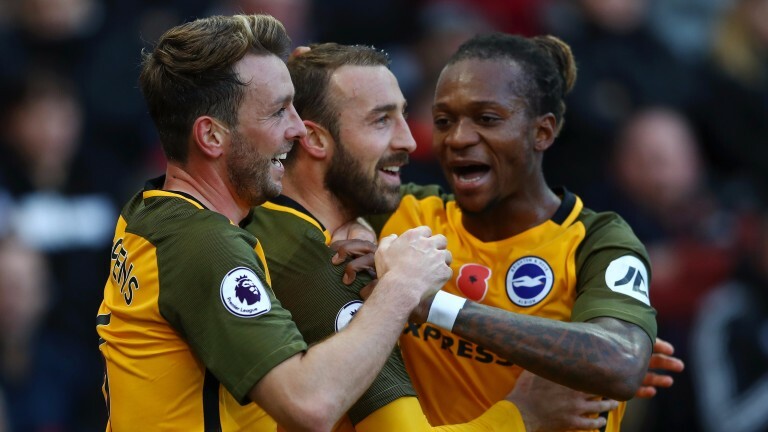 It would be wrong to suggest Albion are rock-solid home bankers at the Amex, although they have settled well enough to overcome visiting Stoke and fly the flag for the new boys after Huddersfield and Newcastle both shipped four at the weekend. The fact that all three are in the top 11 suggests the Premier League's bottom half may not be up to much this season and Stoke are one of a number of established outfits in danger should the likes of Brighton be able to avoid relegation. This is a key game for the Seagulls, who are about to hit a tough run of fixtures that sees them take on Manchester United, Liverpool and Tottenham in the next six outings, not to mention a home date with arch-rivals Crystal Palace. Chris Hughton will be keen to press on from their strong start . Albion are unbeaten in four home league contests since Manchester City won on the opening day at the Amex. West Brom and Newcastle were beaten and it could be argued Brighton should also have seen off Everton and Southampton rather than drawing 1-1. A last-gasp Wayne Rooney penalty gained a point for the Merseysiders and Saints were on the back foot for most of the game. Brighton have also recorded impressive away victories to nil at West Ham and Swansea as Hughton builds on solid defensive foundations set by centre-backs Shane Duffy and Lewis Dunk. Dale Stephens and Davy Propper sit in front of the back four but they have found more attacking intent in recent weeks thanks to wide players Anthony Knockaert and Jose Izquierdo making impacts. Pascal Gross is the biggest threat and, for all that Brighton would love another striker, Glenn Murray has managed four goals in his last three matches. Stoke, who have won three Premier League matches this season, arrive having suffered five defeats in eight in all competitions. Super-sub Peter Crouch saved them in a draw with Leicester last time out, although the fact the veteran is Stoke's joint-top scorer with three goals hints at a problem position for the Potters. One clean sheet in ten should also be a concern for Mark Hughes and it was interesting that all three league triumphs this season have come without any degree of midfield control. Stoke had 23 per cent possession against Arsenal, 29 per cent against Southampton and only 30 in the win at Watford. Steve Sidwell is Brighton's only absentee. Jack Butland, Geoff Cameron and Stephen Ireland are out. Ten of Brighton's 13 matches this season have featured no more than two goals. Stoke, who have won three Premier League matches this season, arrive on the back of five defeats in eight in all competitions.